Shaffer Park was purchased with a United States Housing and Urban Development Space Grant,which designated it as open land in an urban area for recreational use. Around the same time that Shaffer Park came to be, a movement for the preservation of open space was gaining momentum in the United States, as it was becoming apparent that the American landscape was changing and not for the better. After World War II, as land all over the United States, including rural Pennsylvania, was converted into suburban subdivisions, people started to notice changes in the landscape and became worried about the destruction of the countryside. This worry sparked an entire movement in the 1950s to defend and save the nation’s “open space.” The post-war building industry, with its mass production techniques and large-scale machinery, were capable of manipulating a landscape by flattening steep slopes or filling in gaps or waterways. Bulldozers made the destruction of woods more economically efficient, which was beneficial to the builders who saw land as a commodity and wanted to build as many houses in one area as possible. Throughout the 1950s, a million acres of land were lost every year to cities and suburbs. The development of the Interstate also contributed to suburban sprawl, as it made it possible for people to work in cities while living outside and commuting back and forth to them. Interstate highways caused additional losses of existing parks and green spaces. The Pennsylvania Turnpike runs directly beside Shaffer Park, showing that even when visiting the green space, the evidence of suburbanization is difficult to ignore. Drastic changes to the landscape were appalling to many people: neighbors, farmers and even children who didn’t want to see their play areas destroyed. Activists and grassroots organizations came together in an effort to undo the damage of suburban sprawl. They argued that open space was important for maintaining the ecological balance, uniqueness and beauty of a community. An article on rapid suburban sprawl and the need for open space and farmland preservation in Pennsylvania was published in The Carlisle Evening Sentinel in June 1968. Governor R. Shafer voiced his concern about the rapid development of Pennsylvania’s farmland, citing that in only twenty years, 20% of the state’s farmland had been destroyed by erosion or suburban development. The work of the activists seemed to have paid off by the 1960s when the government began offering grants to local governments for open-space acquisition. 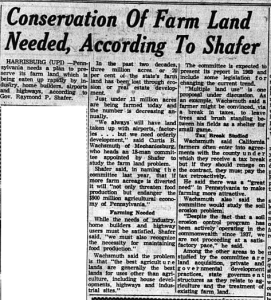 Interestingly in 1968, the same year the article on land conservation was published in the Carlisle Evening Sentinel, the land that is now Shaffer Park was purchased with a governmental grant specifically intended for open space preservation. Shaffer Park is therefore both an example of the effects of suburbanization as well as the preservation movement. As a result of the open space preservation movement, Shaffer Park was founded and for many years has been sustained as a space removed from, yet still surrounded by, suburbia.